This is an utterly gorgeous book! Based on her tried and tested six-step approach Anna has designed her book to be a manual on technique, a source of inspiration and also as she describes; `the voice of kindness encouraging you to keep practising so that you too can enjoy painting to the full' The beautiful full colour illustrations are incredibly detailed and with step-by-step instructions to help you create your own versions. We absolutely loved it! Highly Recommended! This really rather attractive book is pitched somewhere between the basic guides to flower painting and the more technical botanical illustration works. Anna Mason's technique involves a six-stage process that starts with the highlights, which are normally in the centre of the flower, and works outwards, adding details, tints and contrasts so that shapes and depth are built up progressively while preserving the main form. There is also plenty of information on painting methods and the use of colour, but these assume a reasonable amount of basic knowledge, so that you don't spend half the book wading through stuff you should know already. The overall approach is busy and varied and the concentration is on the painting rather than the flowers - that's to say, it's about creating a work of art rather than recording a specific species. There is, however, plenty of variety (more than varieties) and examples of different flower types, shapes and colours. If you're looking for a book that takes you on from the basics but isn't obsessed with botanical details, this would be perfect. The demonstrations, while working within the aforementioned six-stage process, have a reasonable number of steps so that while you're not shown every brushstroke, neither are you pitched from one completed section to another and wondering how you got there. As this is one of Search Press' occasional hardcover books, expect a visual treat and something rather special. Flowers lend themselves to lushly illustrated large format books like this one and this book lives up to its subtitle of "creating vibrant botanical portraits in watercolour". The book is in two halves, firstly getting to grips with the materials and secondly several staged paintings to work through. You can find some outlines at the back to trace so here is a nod to the popular Ready To Paint series that ought to work well with beginners, and those new to watercolor. The pictures here are well described as portraits, and combine the botanical appearance of old prints with a modern, vibrantly colorful approach. There are all the usual features in here from what you need to buy to color wheels, perspective, mixing colors etc, as well as intriguing sections on learning to see, getting the paint consistency right, laying out a palette and creating tone and hue. I don't think I have seen such an in-depth look at the medium before and it certainly bears reading and having a go even if you think you are past that stage. The author then shows us her six stage method of painting and works though a picture of a rose, before going onto the six staged projects which are handily arranged in order of difficulty. If you can't get onto a real course here is the next best thing. 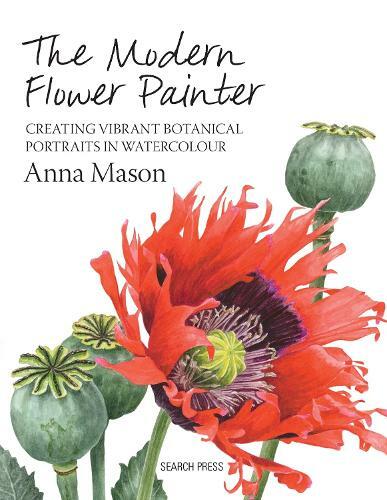 The first thing you notice about this impressive book on watercolour flowers is the warm-hearted nature of Anna Mason. Anna has developed a six-stage process that really works. Plus this book is full of professional tips. There's information for beginners but also a challenge for those with some experience. There are step by step projects and gorgeous finished work. This is a beautiful book and Anna's warm personality and immense talent shines on every page. Highly recommended for any watercolour flower painter and botanical artists.